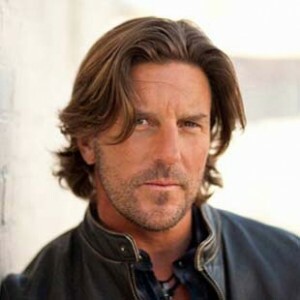 During the past dozen years, Nashville-based Brett James has become one of the hottest, most successful songwriters in the music business. He has twice been named Songwriter of the Year at the ASCAP Country Music Awards (in 2006 and 2010). In 2007 James received a Grammy Award for Best Country Song, for co-writing the #1 hit “Jesus Takes The Wheel” for Carrie Underwood. Also, James has been on Billboard’s year-end Top Ten Country Songwriters list for seven of the past 10 years. Notably, James has co-written 11 songs which reached #1 on the Billboard Country Songs chart, plus several more singles which made the Top 10. James has also had an impact on the pop charts; he co-wrote the new single “This Time” for American Idol contender Pia Toscano, and he co-wrote the upcoming single by Kelly Clarkson. In addition, James has previously had singles and cuts with Daughtry (the hit “Life After You”), Bon Jovi, Leona Lewis and the Backstreet Boys. James first arrived in Nashville in 1992, and he was signed as an artist to Arista Records. But it was in 1999 that he started having a long run of chart hits as a songwriter. His first hit was “You Won’t Be Lonely Now” for Billy Ray Cyrus. From that point on, he’s co-written an array of hits such as “Who I Am” (Jessica Andrews), “Blessed” (Martina McBride), “Love You Out Loud” and “Summer Nights” (Rascal Flatts), “You Save Me,” “When The Sun Goes Down,” “Out Last Night” and “Keg In The Closet” (Kenny Chesney), “Jesus Takes The Wheel” and “Cowboy Casanova” (Carrie Underwood), “Drugs Or Jesus” and “It’s A Business Doing Pleasure With You” (Tim McGraw), “Get Off On The Pain” (Gary Allan), “The Truth” (Jason Aldean), “It’s America” (Rodney Atkins), “The Man I Want To Be” (Chris Young) and “Good To Be Me” (Uncle Cracker). In addition, James co-wrote the current hit “I Love You This Big” for American Idol winner Scotty McCreery, which was a hit on both the country and pop charts. James also has solid credits as a record producer; he’s worked with Taylor Swift, Jessica Simpson, Josh Gracin, plus new MCA/Universal artist, Kip Moore. We are pleased to present this Q&A interview with Brett James. He tells how he got started in the music business, how he wrote some of his hits, and the impressive run of hits he’s had in the past year. When asked, James also offers advice to young songwriters who are trying to break into the business. DK: How did you get your start in the music business? 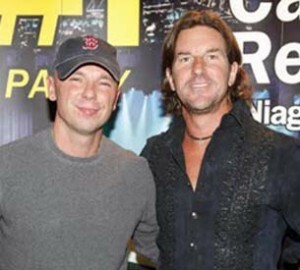 Kenny Chesney (left) & Brett James. James: I’m from Oklahoma, and I was in my second year of medical school at the University of Oklahoma. I was also playing guitar and writing songs. Then I went to a Steve Wariner concert and it inspired me to focus on music–I thought I could write songs and I could sing. I recorded a demo tape and took a trip to Nashville in 1992. I played it for a few labels, and Tim DuBois (then President of Arista Records) liked what he heard. Tim said, “If you move to Nashville, I’ll sign you to a label deal.” So I moved to Nashville and recorded two albums for Arista. However, things didn’t go as well as I’d hoped. Arista released my first album (in 1995) but not the second one. I signed a publishing deal but I didn’t have a hit yet, so I had to take a pay cut. So in 1999, after seven years in Nashville, I decided to pack up and move back to Oklahoma and return to med school. At the time, I honestly thought that I might be done with my music career. But then things started to happen, even though I was back at med school. I found out I got a cut with Faith Hill that would be on her big album, Breathe. Then I suddenly got 33 cuts in one year! DK: How did you get so many cuts if you were back at med school? James: I would go to med school in the mornings, and then write songs in the afternoons and evenings. I would write with Troy Verges, and with Hillary Lindsey. I had also signed a publishing deal with Mark Bright, who is known for producing Carrie Underwood. Mark’s publishing company was fairly small, so I got a lot of attention which led to many cuts. Then I wrote “Who I Am” with John Bettis (who is now in the Songwriters Hall of Fame), which became a hit for Jessica Andrews. 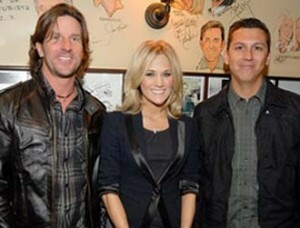 DK: I really like your song “Jesus Take The Wheel” for Carrie Underwood. How did you write this song? James: I wrote this song with Hillary Lindsey and Gordy Sampson. It was a typical co-writing day. We show up at 10:30 am, drink coffee, and hope we come up with a good song. Gary had the title “Jesus Takes The Wheel,” and we started working on it. We came up with the story about a girl driving to Cincinnati. DK: Did you feel right away that you’d written a special song? James: At the time we didn’t know it would be a hit. But it turned out to be the right song for the right artist. Later on we realized how much it meant to people–it struck a nerve, particularly the faith aspect of the song. DK: Who are the main co-writers that you work with? James: Troy Verges is my main co-writer; he’s a dear friend. I’d say my core group of co-writers would be Troy, Hillary Lindsey, Blair Daly and Gordy Sampson. But I like to write with a lot of different writers…I spread out pretty wide. DK: Approximately, how many songs do you write per year? James: I write and demo about 80-100 songs per year. I tell young songwriters that they should write 100 songs per year, then get 30 of these songs put on hold, then get 10 cuts per year, to hopefully get one hit per year. DK: These days, it’s known that album cuts don’t make much in royalties; songwriters need to get the hit single which generates strong performance income. So when you sit down to write a song, are you always trying to write a hit? James: Songwriting is both inspiration and perspiration. We try to come up with song idea which is inspired. Then we take this idea which moves us, and try to write the song in a way which could hopefully move a lot of people (and become a hit). It’s great being a songwriter who writes for other artists. I get to write from the perspective of both the male or female person. It’s kind of like acting–I’m thinking about what the character (the artist) would want to say. DK: During the past year, you’ve had a great run, writing six hits and winning ASCAP Songwriter of the Year. How did you do this? James: It was an exceptional year. There’s definitely luck and timing involved. These six hits were not all written in the past year; they were written over a period of five years. It just happened that they were cut and became hits in a one-year period. DK: Of these six songs, how many were written with the artists? James: Three songs were written with the artists. The other three hits were outside songs that were pitched to the artist. DK: Do you have your own publishing company, and do you sign writers? 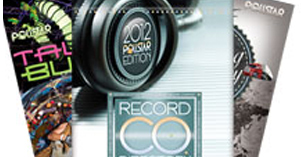 James: Yes I have a publishing company called Cornman Music. We’ve signed three writers so far: Kip Moore (signed to MCA/Universal Records), writer/producer Justin Weaver, and artist Caitlyn Smith. DK: You’ve just signed a deal with Combustion Music and Warner/Chappell. How does this deal work? James: I put it together with Chris Farren of Combustion Music and Steven Markland of Warner/Chappell. Chris and Steve are both dear friends. Steven was a groomsman at my wedding. We figured out a way that we can all work together. Both Combustion and Warner/Chappell will be pitching our songs. DK: I’ve noticed that you’re now having major pop success in addition to country. DK: Lastly, what advice would you give to young songwriters who are trying to break into the music business? James: It’s all about working hard and studying hard–there’s no magic pill. I read a book called Outliers: The Story Of Success (by Malcolm Gladwell). It mentions a “10,000-Hour Rule.” It says that it takes 10,000 hours of practice to master anything. I feel this can apply to songwriting–it takes about 10,000 hours of writing to become skilled at it. It takes time to study and work at your craft. Sometimes I think that young writers don’t study the music they love. If you like Bruce Springsteen and you want to be inspired to write songs (in this style), you need to buy his music and study the lyrics. The same is true if you’re an Eminem fan. You need to take the time to study his music and lyrics.